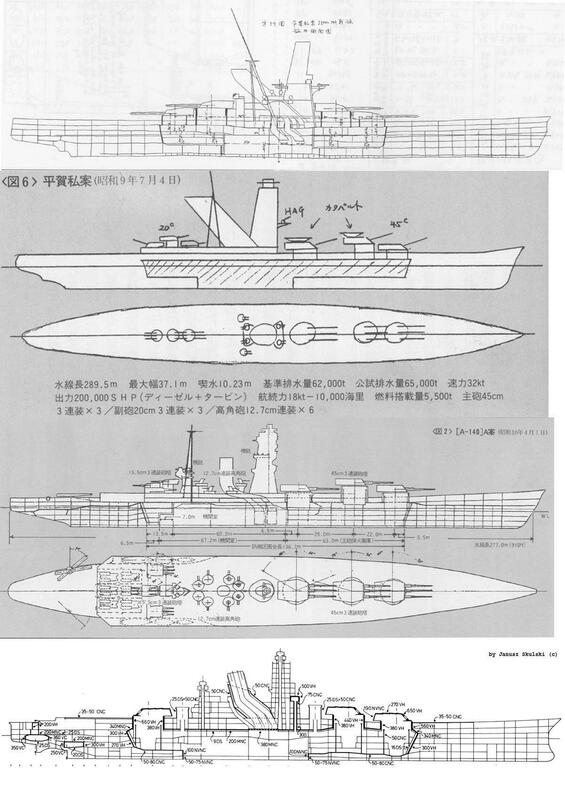 At the time when multiple designs emerged as to what to replace the ageing Kongo class battlecruiser by the terms of WNT, the Admiralty of the Imperial Japanese Navy ordered a set of studies of what can be done on 50-65.000ton displacement and with maximum possible gun calibre and high speed. Hiraga Yuzuru, prominent naval architect of the time sketched up a battleship reminiscent of her Kongo replacement variants of 1928/29 with similar bridge and funnel arrangement, but with a Nelson style all forward arrangement of its 45cm main guns. To compensate with the added weight forward the secondary armament of 200mm guns in 3 triple turrets focused all aft. A tall towering superstructure would provide the necessary height for the range finding equipment and the heavily angled funnel would put the smoke far away from the command staff and equipment. Heavy AA guns were of the new type 12,7cm one, finishing development at that time. Propulsion system too would be unique as a mixed propulsion of Diesel and Steam Turbines to be used to propel the ship. The hull form is traditional or rather cruiser like with long sleek lines giving it a good length to beam ratio to further help achieving the desired speed. Though it is not perfect design, the catapult arrangement is awkward as the 1st catapult which is on top of the 2nd turret is located very high: 10.5m from the deck and 18m from the waterline! Further, giving concern the blast effects of the 45cm cannons on the catapults, though the turrets large and massive size would allow the installation of rotatable catapults rather than fixed ones. Overall this might be the very first idea and iteration of what eventually lead to the Yamato class battleships of 1936!